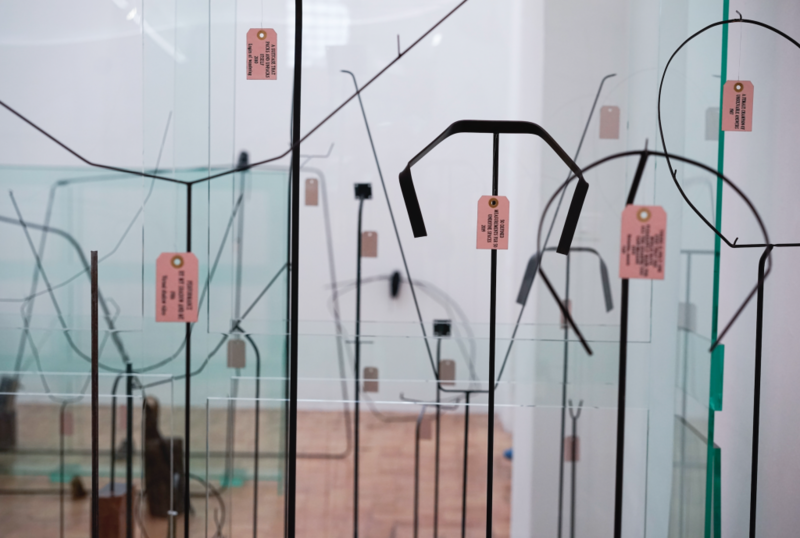 The exhibition will be exceptionally closed Sunday, April 15 on the occasion of Giardini Aperti: Coltiviamo, cultivons ! 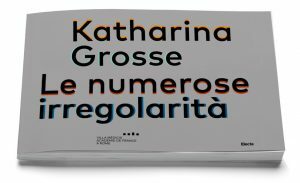 The French Academy in Rome – Villa Medici is pleased to present Le Numerose Irregolarià (The Many Irregularities), an exhibition with Katharina Grosse and Tatiana Trouvé. This is the fourth and last exhibition in the UNE cycle, originated by Muriel Mayette-Holtz and curated by Chiara Parisi. UNE is an ambitious project which, through artistic, intercultural and generational confrontation, has given rise to surprising collaborations and interconnections, providing a contemporary vision of the French Academy in Rome. 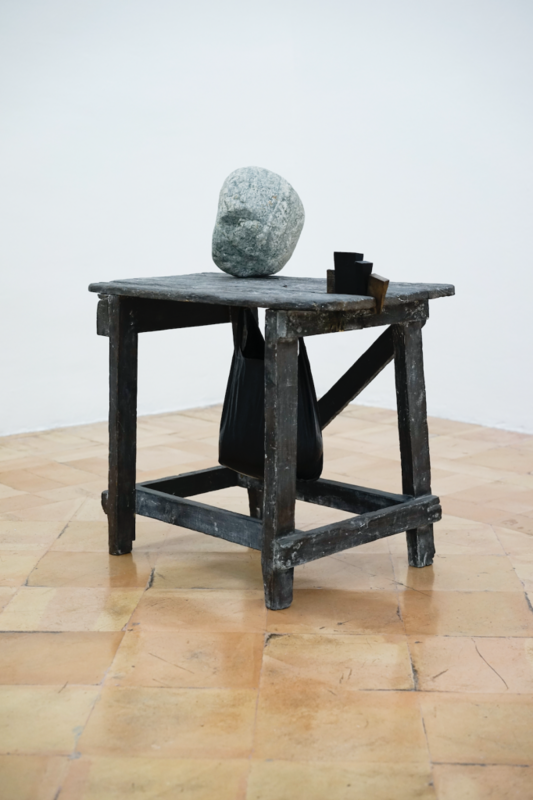 Since February 2017, UNE has enabled unique encounters : Yoko Ono with Claire Tabouret; Elizabeth Peyton with Camille Claudel and Auguste Rodin; Annette Messager and the “presence”of Balthus. 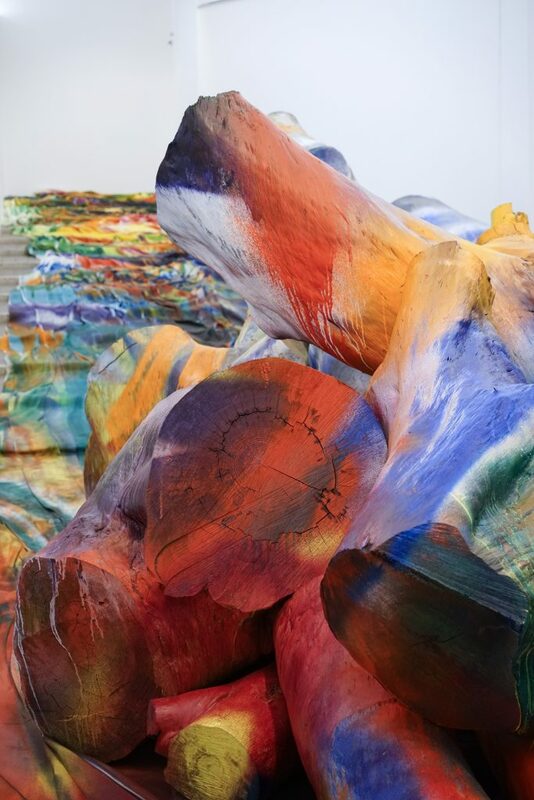 Katharina Grosse chose painting, understood as a membrane, as her main means of expression, while Tatiana Trouvé explores the infinite variables and possibilities offered by drawing : the unpredictable strength of colour intertwines with the power of seduction held by a decontextualized sculptural object. “A shared radicalism, founded on the idea of reversal, emerges from both of these artists,” writes Chiara Parisi in the exhibition catalogue. 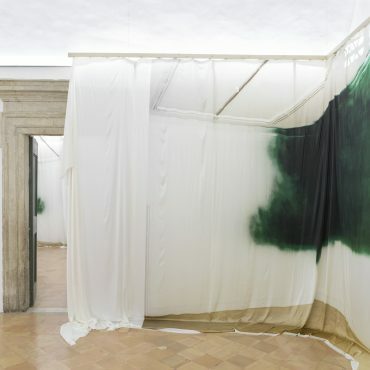 “In the case of Katharina Grosse, space in all of its forms is exalted by painting. Landscape is no longer hosted by the canvas, landscape becomes the pictorial surface. 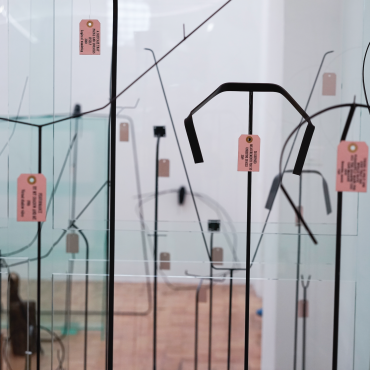 In the same way, Tatiana Trouvé produces unpredictable assemblages and associations. Thus, works are born whose starting point is concrete, but which cause us to lose the familiarity that we have with specific objects. The exhibition itinerary starts with works by Tatiana Trouvé, created in 2017. The installations Somewhere in The Solar System, The Great Atlas et Disorientation and Evaporating Crater evoke huts and incorporate ancient and current migration maps. From 2002 to 2016 is a work composed of an assemblage of bronze soaps, each of which in linked to an exhibition associated with the work of several people in the artist’s studio: when the work is finished and ready to go to its exhibition place, a soap is moulded. In a way, this little sculpture is the result of work shared by many hands. 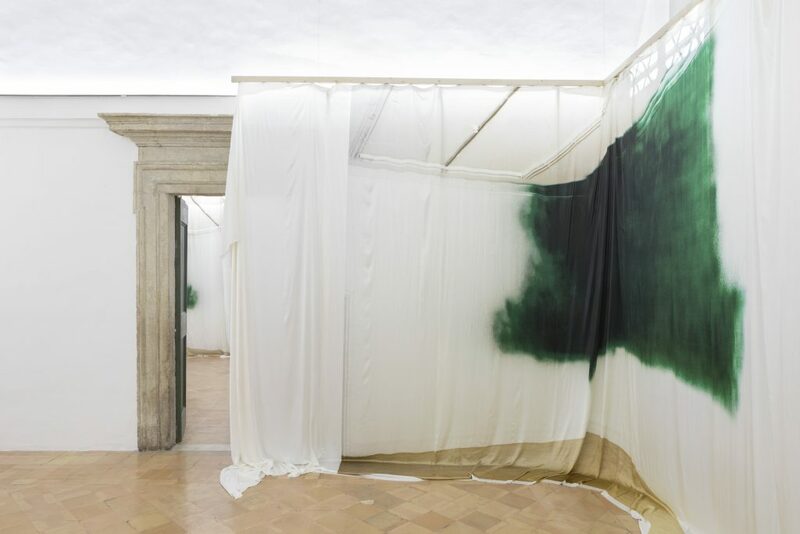 Immediately after, the visitor encounters the Tatiana Trouvé’s sculptures, Notes on sculptures, September 15th, “Jill” 2016 and “Peter“2016 that dialogue with the painted silk Untitled (2013/2018) by Katharina Grosse, also present in the first room. On the one gand, three-dimensional research is displayed – sculptures and installation fragments – that Tatiana Trouvé defines as “sculptural annotations”; on the other hand, the tangible manifestation of Katharina Grosse’s insatiable appetite for space shaped by painting, and her real talent for proliferating architectural structures. These united and superimposed works represent the paradigm of a one-on-one encounter, of a surprising and original confrontation from which shared irregularities emerge. 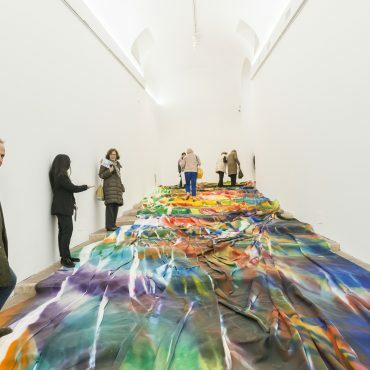 The great gallery hosts Ingres Wood (2018) by Katharina Grosse. The artist, being unable to intervene directly on the Villa Medici’s architecture, used bits of tree trunk found in the Medici garden, coming from one of the recently cut-down great pines that Ingres had planted when he was director at the beginning of the nineteenth century. 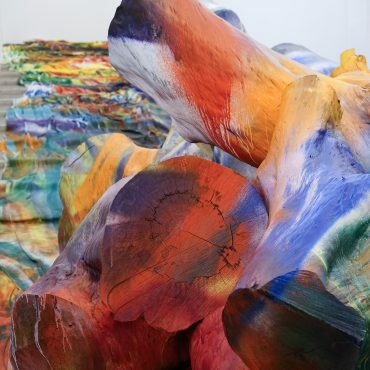 Katharina Grosse gives new life to this tree that disappears under her action, through unique inventions with colour. She reconfigures the environnement by bringing a part of the garden into the interior of the Villa and creates a temporary dislocation of the natural element. The staircase, under the domed ceiling, thus becomes the new abode of this century-old tree, whose branches bow on abundant drapery, covering the steps. This ensemble gives the sensation of being faced by one-on-one sensual struggle between the lines of the tree and the colors of the painting that the artist created in situ. The exhibition concludes with Wander Lines (2016) and Les Indéfinies (2017) by Tatiana Trouvé. Wander Lines is a sculpture whose metallic lines follow a wandering path through space. As for Les Indefinies, they gather the works of the artist which remain at a threshold. They exist but can’t find their place in the overall arrangement of a work : they are neither the cast-offs nor scraps of a production. They simply cannot manage to connect with the others and so remain at the fringe, isolated, until they create a singular group of “loners”, which invent their own mode of exhibition. 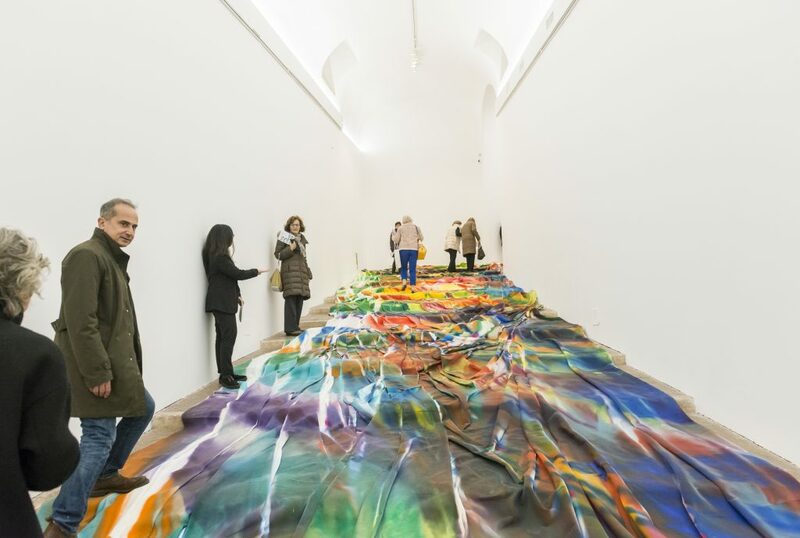 Katharina Grosse (Freiburg, 1961, lives and works in Berlin) studied at the Kunstakademie in Düsseldorf and the Kunstakademie in Münster. She is recognized internationally for her temporary and permanent works, created in situ by painting directly on buildings, constructions and landscapes. The artist welcomes unforeseen events that take place as she paints, opening spaces and surfaces to the countless perceptual possibilities of her preferred means of expression : painting. Her research begins in her studio, a place of constant experimentation on new materials and on the power of colour. Her works have been shown within numerous solo and group exhibitions in public and private institutions around the world. Solo shows include those at the Palais de Tokyo, Paris (2005) ; ARKEN Museum for Modern Kunst, Copenhague (2009) ; Nasher Sculpture Center, Dallas (2013) ; Garage Museum of Contemporary Art, Moscou (2015) ; Museum Frieder Burda, Baden-Baden (2016). Her most recent site-specific installations include : The Horse Trotted Another Couple Of Meters, Then It Stopped for the imposing industrial architecture of the Carriageworks à Sydney, the unforgattable Untitled Trumpet for the 56th Venice Benniale in 2015 and Rockaway ! for MoMA PS1 in 2016. 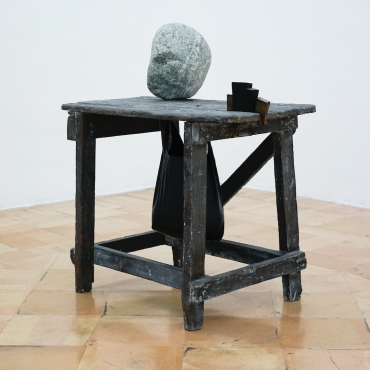 Tatiana Trouvé ( Cosenza, 1968, lives and works in Paris) has participated in major international exhibitions such as the Venice Biennale (2003 and 2007), the 29th Sao Paulo Biennal (2010), the Hayward Gallery of London (2010) and the Pinault Foundation Punta della Dogana, Venice (2011), the Biennale de Lyon (2015), the Istanbul Biennal (2017), the Yokohama Triennale (2017) and BIENALSUR, the 1st Contemporary Art Biennial of South America (2017). Solo exhibitions include Double Bind at the Palais de Tokyo, Paris (2007), 4 between 2 and 3 at the Centre Pompidou, Paris (2008), A Stay between Enclosure and Space at the Migros Museum in Zurich (2009), the South London Gallery (2010) and II Grande Ritratto, a major exhibition inspired by the title of a science-fiction novel by Dino Buzzati and designed in response to the demanding architecture of the Kunsthaus Graz in Austria (2010). The travelling exhibition I tempi doppi was presented at the Kunstmuseum Bonn, that Museion Bolzano-Bozen and the Kunsthalle Nürnberg (2014). In 2014, The longest Echo – L’écho le plus long at Mamco, Geneva inaugurated her first retrospective exhibition. Her first solo exhibition in China The Sparkle of Absence took place at the Red Brick Museum, Beijing (2016). The Public Art Fund commissioned Desire Lines, presented at Central Park in New York in 2015. In 2018, she will open three solo exhibitions at the Broad Art Museum in Michigan, at the Petach Tikva Museum of Art in Tel-Aviv and at the Printemps de Septembre in Toulouse. 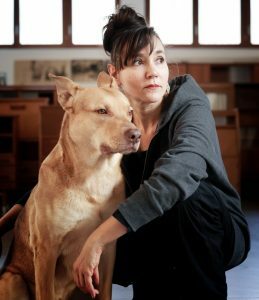 She won the Marcel Duchamp Prize in 2007. Cultural liaison : As part of the combined work/study project being carried out by the Italian Ministry of Education, Universities and Research, every Tuesday, Wednesday and Thursday from 3:30 to 5:30 pm visitors can be accompanied by a student cultural liaison team. Exhibition hours : Tuesday to Sunday, 10am-7pm (doors close at 6:30 pm). Closed on Mondas. Admission to the exhibition only : Combined pass for the exhibition and a guided tour of the gardens and the Villa : 12€/ Concessions 6€*. Admission to the exhibition only : 6€/admission free for under-18s. *Concessions : under 25s, over 60s, jobseekers (proof of status required), art history teachers, residents and members of the other academies and foreign institutes based in Rome, holders of a student card, Roma Pass, Metrobus, Carta più La Feltrinelli, Bibliocard, FAI, Romaeuropa card or Opera Card.